Flatware Set with Caddy 16 Pc Only $13.99 Plus FREE Shipping! Was $30! You are here: Home / Great Deals / Flatware Set with Caddy 16 Pc Only $13.99 Plus FREE Shipping! Was $30! Get this Flatware Set with Caddy 16 Pc for Only $13.99 Plus FREE Shipping! Was $30! This colorful, modern styled flatware is ideal for your kitchen or picnic table! It has a four compartment plastic caddy that conveniently holds all pieces in place. 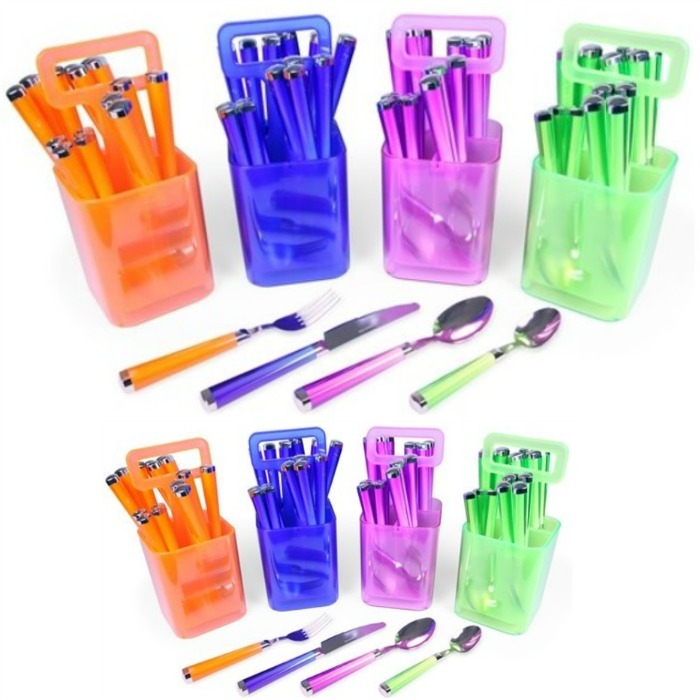 Each piece is expertly-crafted from durable steel to stand up to the rigors of everyday use and features an attractive plastic assorted color handle. This 16 piece set includes 4 each of: dinner fork, dinner knife, dinner spoon, and teaspoon, plus a bonus storage caddy. Dishwasher safe.